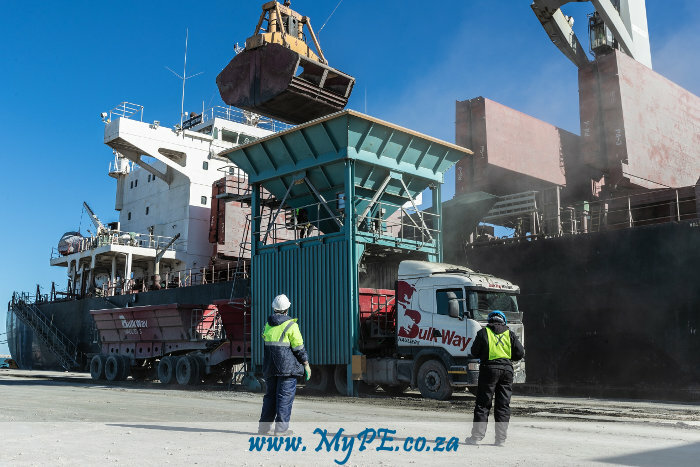 The young developing Port of Ngqura celebrated a milestone in its growth with the arrival of the first vessel discharging cargo for Osho Cement, a new cement manufacturer currently under construction in the Coega Special Economic Zone (SEZ). The GENCO BRITTANY discharged 55 410 tons of cement clinker and gypsum in bulk at the Multi-Purpose Terminal’s Finger Jetty – Berth C101. The ships’ own cranes and grabs, with a capacity of approximately 12 cubic metres each, discharged the cargo which was transported by truck to the Osho Cement factory. “The Port of Ngqura is the preferred gateway for our new client as its infrastructure, draught and location is ideal. The Multi-Purpose Terminal can accommodate the preferred Supramax and Ultramax vessels, carrying tonnages ranging from 55 000 to 63 000 tons. The round trip from the port to the factory site is about 13 km. The port also offers suitable storage space for this type of cargo to ensure a seamless discharge operation,” said Tandi Lebakeng, Port Manager of the Port of Ngqura. “The import volumes are expected to grow steadily over the next five years. We welcome our new client, bringing regular visitors to the port. This is not only good business for the port, but it also means growth for the Eastern Cape and South African economy,” Lebakeng said. Osho Cement’s construction is expected to be completed this year, with commercial production commencing soon thereafter. The company will import its primary raw material, manufacture and sell its products locally as well as exporting cement to Indian Ocean Islands and countries in Sub-Saharan Africa.